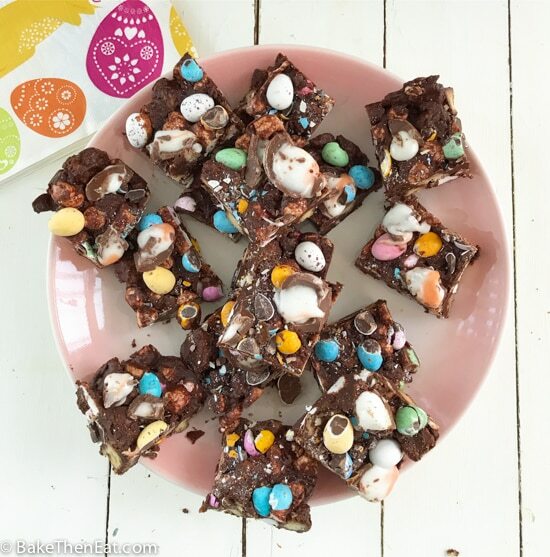 Who doesn’t love Rocky Road, it’s such a popular easy treat to make. And who would have believed that it is almost Easter? Seriously where is 2019 going? It’s been such a busy year already but I have still managed to find time to make and share this super easy, no-bake delicious chocolate treat. 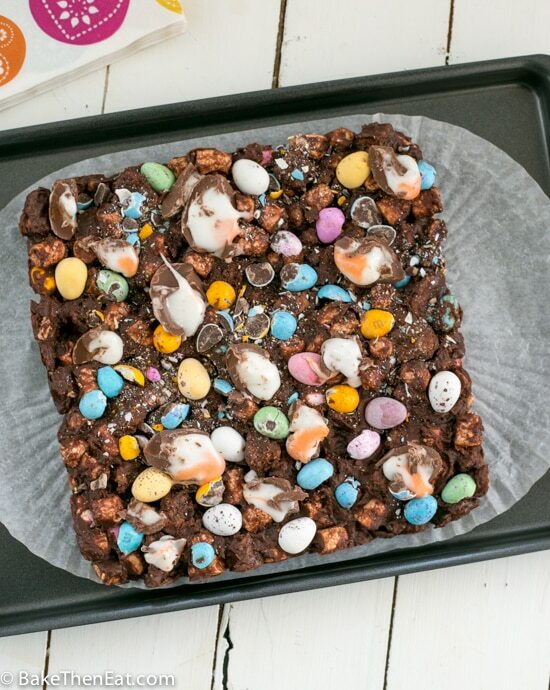 Easter Themed Rocky Road. A perfect treat for Easter laced with mini eggs and creme eggs, that can be made in just 20 minutes! Mini Eggs & Creme Eggs. Which basically just means even more chocolate in every bite! So a double win if you ask me. I also added in sultanas for a sweet chewy element and of course, I used marshmallows. I used special vegetarian ones, but if being vegetarian is not a concern for you than regular ones will work perfectly. 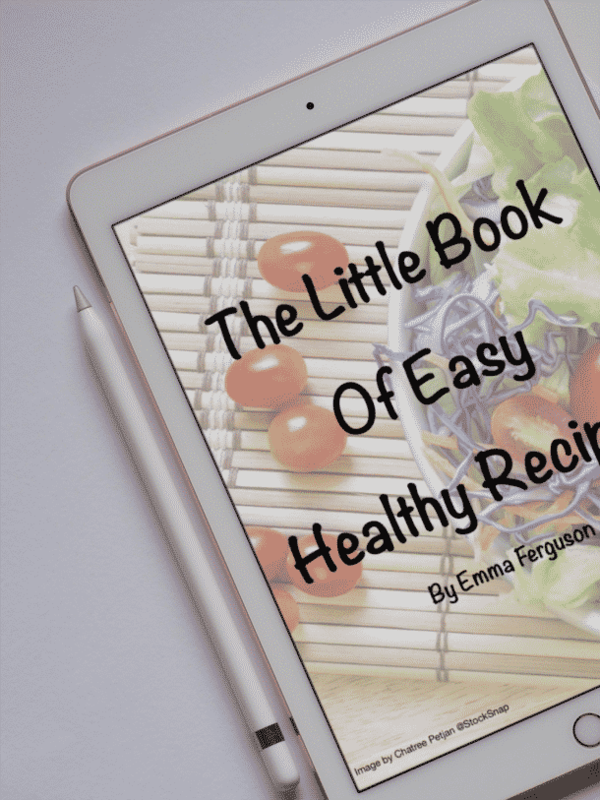 One of my favourite treats and desserts are no-bake desserts. They are usually quick and easy to put together, the majority of time is usually spent with the dessert chilling in the fridge. Allowing you to get on with other things. 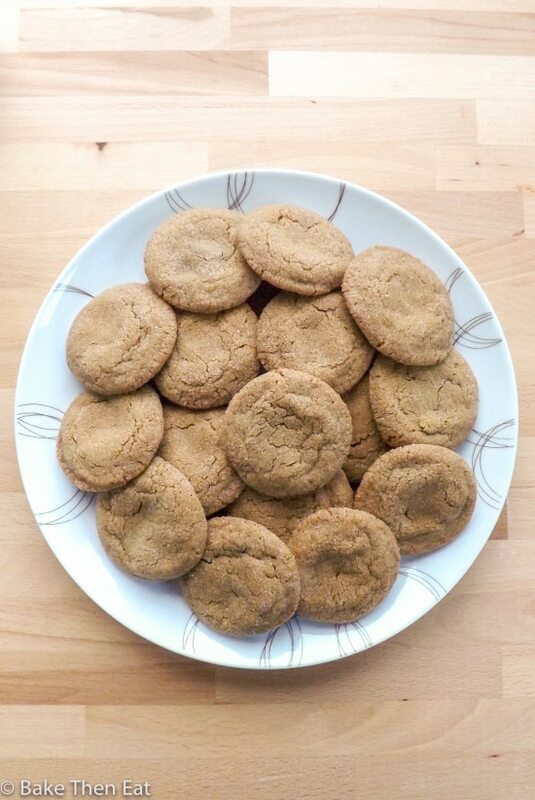 Knowing a delicious treat awaits you later in the day. Some of my all-time favourite treats are no-bake. 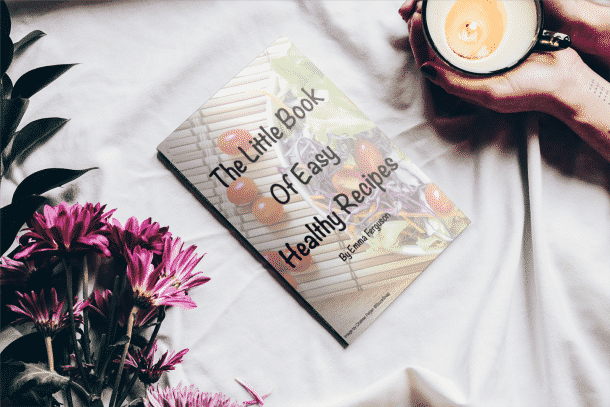 If like me you are a no-bake fan then check out my No-Bake Sugar-Free Vegan Fruity Flapjacks or my No-Bake Peanut Butter Cereal Squares or even my No-Bake Peanut Butter Ritz Cracker Breakfast Bars if you are a fan of the sweet and salty combination. Whichever flavour is your favourite there is a no-bake treat just for you. A classic no-bake sweet treat with Easter candies to make it perfect for the Easter Holidays. 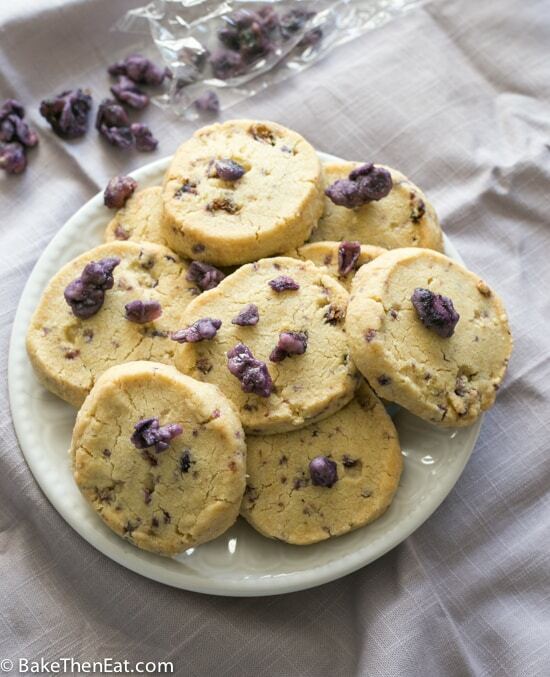 Break the shortbread cookies into small chunks, and place to one side. line and lightly grease a 20cm (8-inch) square line with foil and a tiny amount of butter. Then place to one side. Either in a microwave or a double boiler melt both the dark and milk chocolates together with the butter and golden syrup. If you are using a microwave melt on medium heat in 30-second intervals. Once fully melted place it to one side to cool slightly for a few minutes. 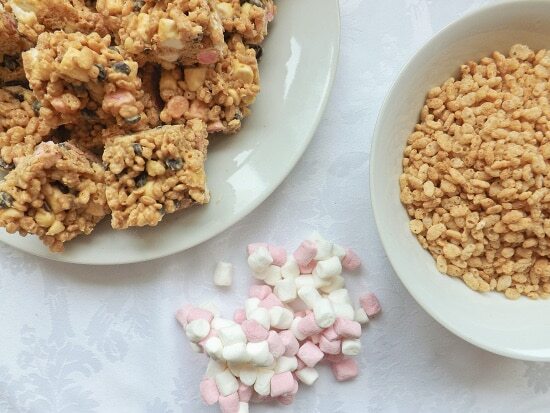 Mix the shortbread pieces, sultanas, mini marshmallows and half of the mini eggs together in a large mixing bowl. Pour the slightly cooled melted chocolate on top and mix everything together until everything is lightly coated in chocolate. Pour the mixture into your prepared tin and lightly press down on it. Sprinkle the remaining mini eggs on top and carefully press down on them to make them stick. 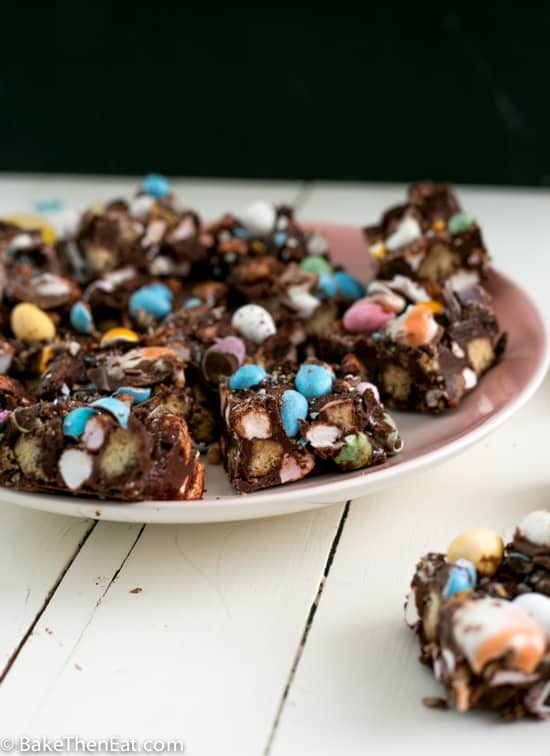 Chop your creme eggs into quarters and place them on top of your rocky road. Place the tray into your fridge for a minimum of 2 hours. Once set cut into 12 squares. Store in an airtight container in the fridge, this way it will keep well for at least 2 weeks. I love all the colors against the chocolate brown! Yum! I love the colors in this! Definitely perfect for easter and spring! And I’m with you – I can’t get over that easter is a week away…. I love doing this when Ihave a lot of leftover Easter chocolate. Although readers always remark that they never have any lol. Really, really pretty. And it sounds fantastic — just packed with flavor. Thanks! Oh, yeah!!! This is the perfect excuse to buy extra Easter candy! What a yummy holiday treat!!! No bake has our vote! So fun and perfect for the Easter festivities. Pinning to our favorite boards. This recipe is just the prettiest! Love all the pastel colors, and I’m sure it tastes just as good as it looks!